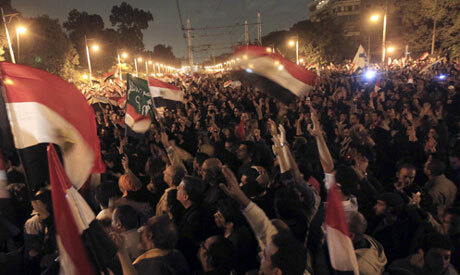 Hundreds of thousands of protesters gathered at Egypt's presidential palace and in Tahrir Square Tuesday to protest a draft constitution and a recent decree by President Mohamed Morsi giving him sweeping powers. "This constitution is all wrong. It violates freedoms and was only created by the Brotherhood and Salafists for their own benefit," said Hanan Sabri, a housewife, as she walked to Tahrir Square, the site of mass protests against the recently issued draft constitution. The Constituent Assembly, which wrote the draft charter, is accused of having been dominated by the Muslim Brotherhood – from which President Morsi hails – and Salafist groups. The assembly has also been marred by several withdrawals, including by representatives of the Coptic Church, labourers, journalists and farmers. The draft constitution itself is seen by critics as unrepresentative of Egyptians at large and as falling short on the freedoms and social benefits called for in the 25 January Revolution. Many articles are also criticised for being vague. "There is an article that states that society should be 'self-critical.' What does that mean? It means that we’ll find people bothering us for not liking what we wear," added Sabri. Amany Moussa – walking in the Madinet Nasr rally, which was launched from the Rabaa El Adaweya Mosque – complained that Egypt had finally seen some stability in recent months, but Morsi’s constitutional decree had again led to violence. "This is the first time I join a protest," Ahmed Ibrahim, another protester at the rally, told Ahram Online. "I am so angry, I feel that the Muslim Brotherhood are dominating everything and taking complete control of the country." Participating in the Abassiya march that set out from Cairo's Al-Nour Mosque, Shaimaa – an independent activist in her twenties – travelled from Suez to join the march to denounce Morsi's constitutional declaration. "We are here to attend the protest; we’ve taken part in all major protests happening in Cairo since the 25 January Revolution," she said, as she arrived with thousands of others in the vicinity of the presidential palace. Like Ibrahim, Shaimaa condemned the recently finalised draft constitution as being "a constitution made only for the Muslim Brotherhood." "Down with the Supreme Guide [of the Muslim Brotherhood]," they yelled, while waving Egyptian flags and banners that read: "We reject splitting the country in two using religion," and, "We reject the constitutional declaration." Protesters also waved flags bearing the images of slain protesters, including Sheikh Emad Effat – who died during clashes between military police and protesters during a December 2011 sit-in – and Sayid Belal, a Salafist activist tortured to death in 2010 under the ousted Mubarak regime. Challenges face the looming constitutional referendum, as Egypt's Judges Club announced it would boycott the poll – and refrain from supervising polling stations as it usually does – to protest what it calls Morsi's "power grab" decree, which they say impinges on its independence. All the Islamist is someway blindfolded in every country. Definitely they are more honest but somehow they think they are the part of the creator and has a tendency to overlook and respect others opinion. The decree has damaged Muslim Brother-hoods reputation that they have earned for years with their honesty and integrity. They need to be more respectful to others’ opinion even if that is expressed by the minority. Islamist must be mindful that religion is for the humanity rather humanity is for the religion. Moussa, Elbaradei and Sabbahi have only one option left - if they care about Egypt's stability and future. They have to tell their followers that the only option left is to vote on the draft Constitution. It's only the people of Egypt that can, by vote, solve this non-consent. A constitution isn't a static device. That's the bargain to strike up with.